The Argonne Motor Car Co. built the Argonne in Jersey City, New Jersey in 1919 and 1920 only. The Argonne was a high quality automobile built by the former manufacturers of the Palmer Singer line (Palmer & Singer Mfg. Co. Long Island City, NY 1907-1914). The Argonne was one of many little sports cars built at this time, fewer that 100 were produced and was named after the fierce battle in Argonne, France during the First World War. Designers Otto Bieir and Harold Porter created the Argonne and The Argonne Motor Car Company of Jersey City, New Jersey, was formed to produce it under the supervision of Charles A Singer. Production included this sporty boattail roadster model along with a four passenger open sport model. The roadster sold for $4500.00 and the four passenger $4700.00. Note that the headlight lenses on the Argonne had patterns to channel the light where the manufacture wanted it to go. The Argonne was equipped with a high speed 3.7 liter four cylinder 33 horsepower Buda, except for the last two which were powered by a Duesenberg engine. Features included a 118 inches wheelbase, four speed transmission, Eisemann high tension magneto, three point suspension, 20 mph per gallon and 70 mph were guaranteed, wheels are wire or disc optional and the tires are 32 inch by 4 1/2 inch cords. 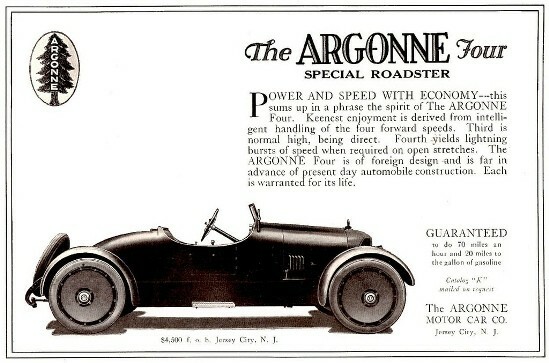 Advertisements began in the latter part of the summer in 1919, but the Argonne made its first appearance at the New York Automobile Show in January, 1920. The Argonne was truely a handsome, well made automobile. However, by the time it was put on the market, the postwar recession of WWI was having a very serious affect on the industry and the company had to close down in March of 1920.